Map and stats Part 1 (uphill) and Part 2 (downhill). Remember that post a little bit ago explaining the granny gear? Today was our forth day riding, and for the first 32 miles (spread out over 7 hours) it was the day of the granny gear. Our first (and second biggest after the continental divide in Glacier National Park) climb of the trip and it was a doozy. We took care of the first eight miles/1,000+ feet of climbing at the end of yesterday, but the real climbing started today. Our first stop at Diablo Lake, 1.7 miles into 34 miles of climbing. 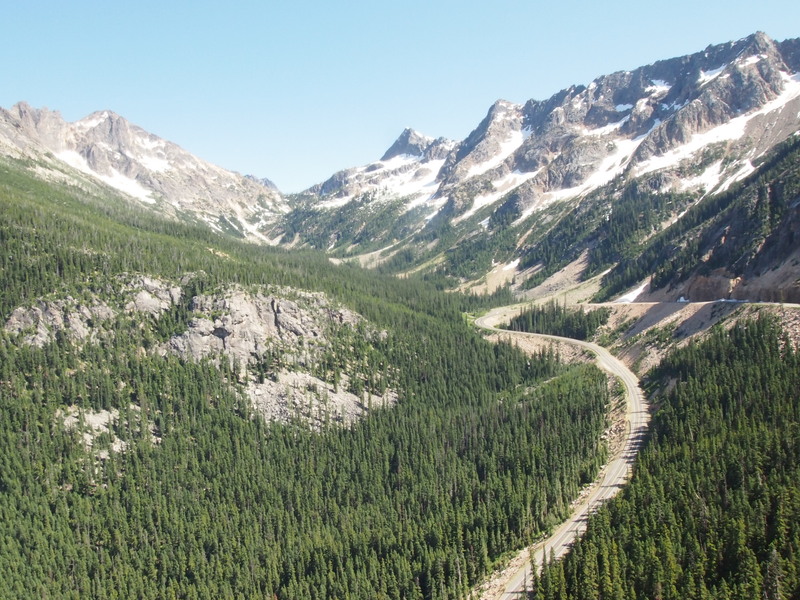 We started off from our lovely campsite at Colonial Creek Campground in North Cascades National Park. And then we climbed. And climbed. And climbed some more. There were a few short downhill interludes mixed in, but mostly we went up. 5,717 feet in 34 miles. It almost doesn’t sound like a lot when I read it back to myself, but it was steep. We lived in our granny gear throughout the morning and early afternoon. The scenery, again, was gorgeous, although I think we didn’t appreciate it as much as it deserved. We took lots of opportunities to stop and take pictures, though. 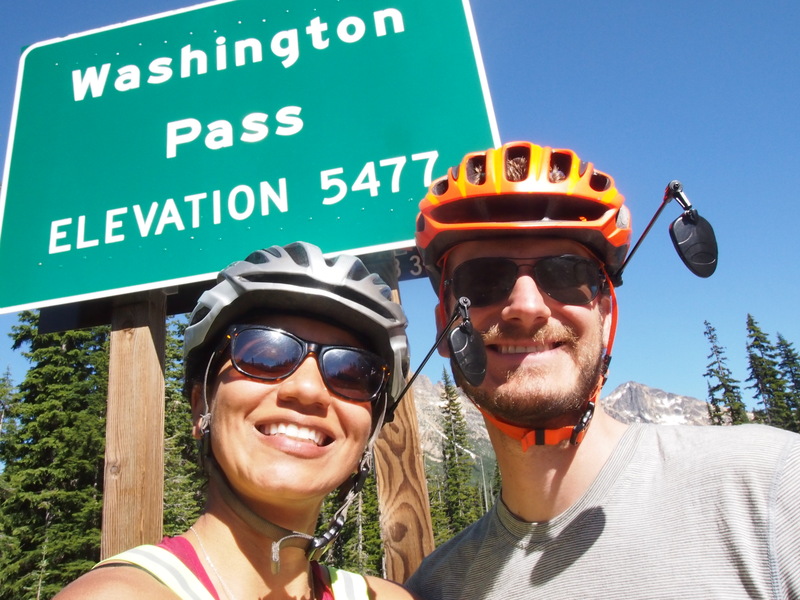 We made it to the top of Washington Pass (the second and final pass of the day) a little before 4:00p. And then the fun started. We cruised through 15 miles of downhill riding, the first six of which were quite steep. Dani thought it was a little scary and was thinking about all the things that could go wrong, but I had a blast. Our average speed over the first six miles was 29.8 mph, and I hit a top speed of 43.6mph. I can’t think of a better way to celebrate finishing a day of climbing than to shoot down a mountain at 35+mph on your bicycle. We stopped in Mazama for what is becoming our routine of binge eating unhealthy food in the late afternoon before we get to camp. Today we went with chocolate milk, a chocolate chip cookie ice cream sandwich, and a whoopee pie (aka, giant oreo cookie). All good decisions. We’re staying at the Barn Bicycle campground tonight. A lovely man named Jim decided to open up the barn next to his house to touring cyclists. It is right on the route and offers a multitude of luxuries like electricity, a refrigerator with ice (and complimentary drinks), a solar-heated outdoor shower, a composting toilet, wifi, and soft grass on which we could set up our tent. And most importantly of all, the “campsite host,” an Australian Shepard named Stout who helped fill the dog-shaped hole in my heart (left by our dog, who is waiting for us to come back home to Brooklyn) for the evening. All in all, it was a great end to a hard day. 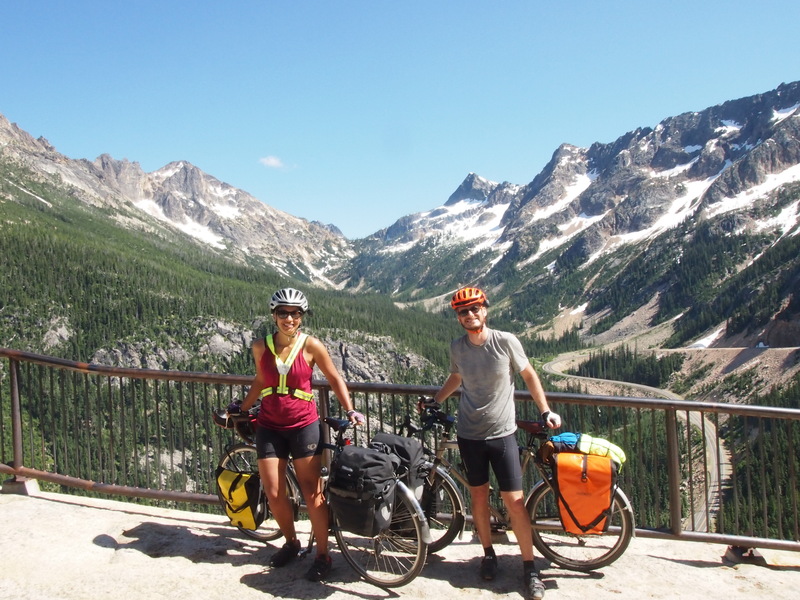 We’re taking it easy on day five, traveling 20 or so miles and enjoying some of the conveniences in the towns of Winthrop and Twisp. (Dani) I wanted to mention that I took an inglorious fall into a ditch on Monday, apropos of nothing but my fascination with my fancy new rearview mirror. Today I ran into a guardrail (at an embarrassingly low speed, so no harm) after panicking about a pickup truck towing a massive RV that passed within a foot of my bike, despite the fact that there was no incoming traffic and he could have easily and safely gotten over a couple feet. The slightest turn of the handlebars with heavy bikes at low speeds causes a dramatic turn, so these climbs call for lots of balance and coordination that I seem to lose in moments of panic. Side note: if you or someone you know drives a massive vehicle, or any vehicle for that matter, tell them to give cyclists a little space. If there is oncoming traffic, it’s not that hard to slow down for a moment to avoid the other option of speeding past a cyclist at a close distance. It may take three seconds out of your day, but you could save someone’s life! Other than those two incidents, I’m getting the hang of biking around with 50 pounds of stuff. 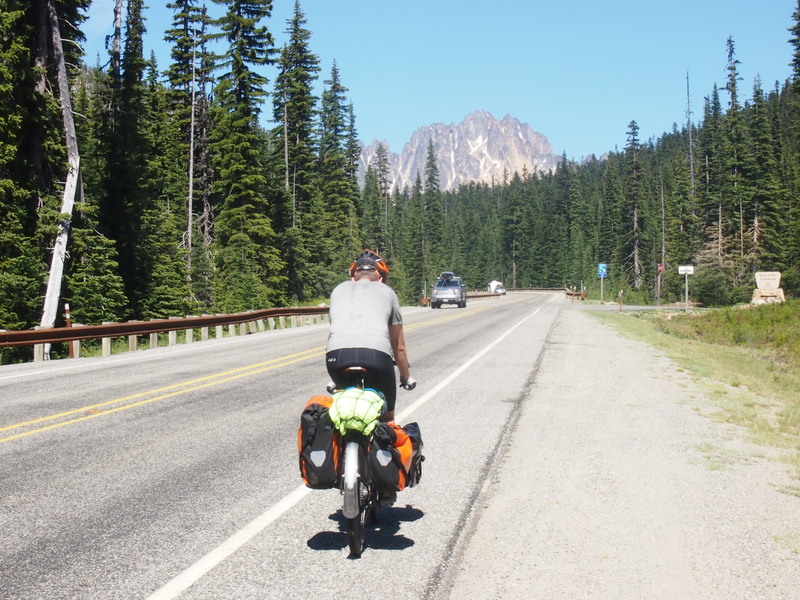 (Ted) I think one of my favorite things about bike touring is that it really helps you focus on enjoying the journey rather than always focusing on the destination. 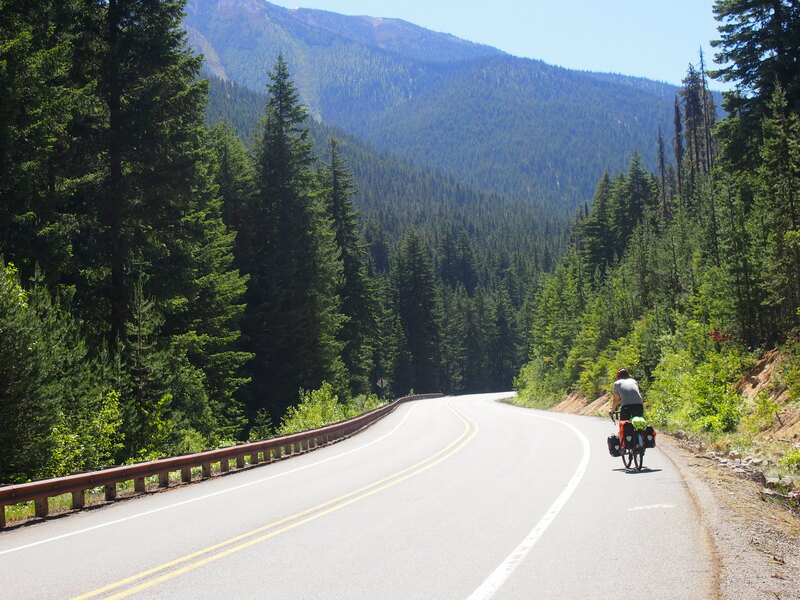 When you’re on your bike, it’s ok to stop on a whim to take a picture, eat a snack, or even just sit around for a while. When I’m driving, I always feel a guilty for stopping unless I need gas because it’s inefficient. But biking across the country is inefficient by definition, so it’s not a problem. And when you’re riding uphill for miles and miles, any reason to stop is a good reason. 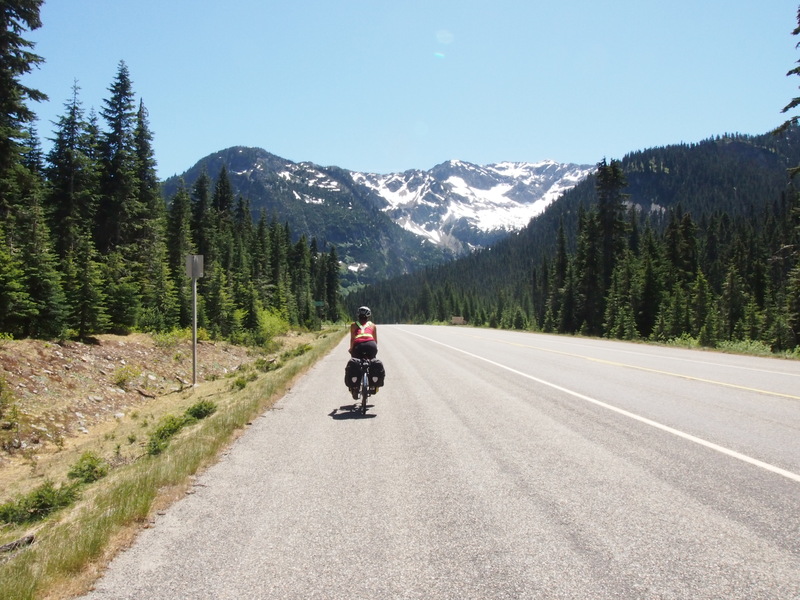 My favorite stop of the day today was Dani deciding that it was just too darn hot and pulling off the road a couple miles before Washington Pass to dunk herself in a snowmelt waterfall coursing down the side of the mountain. The ice-cold water was perfect for a hot day of riding, and how often in life do you have the opportunity to just jump into a waterfall in the middle of the day? 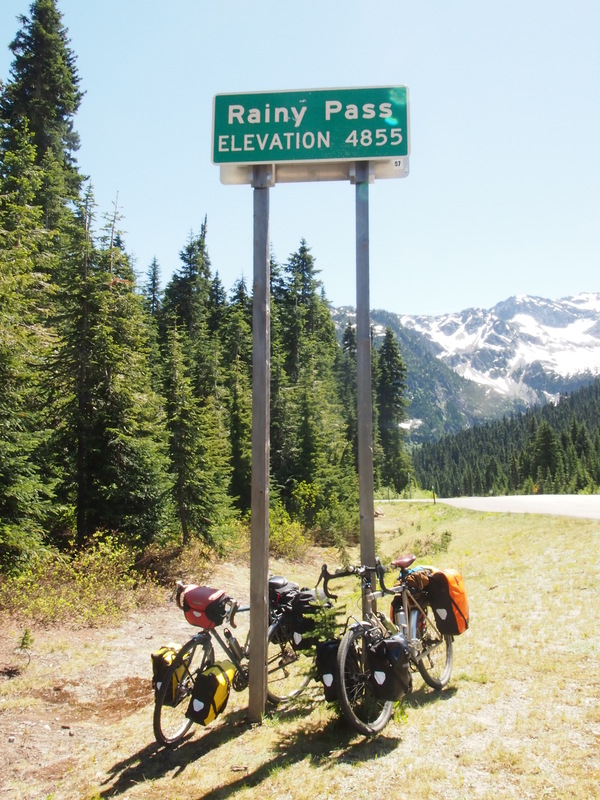 Congratulations on making it across the pass and into central Washington. 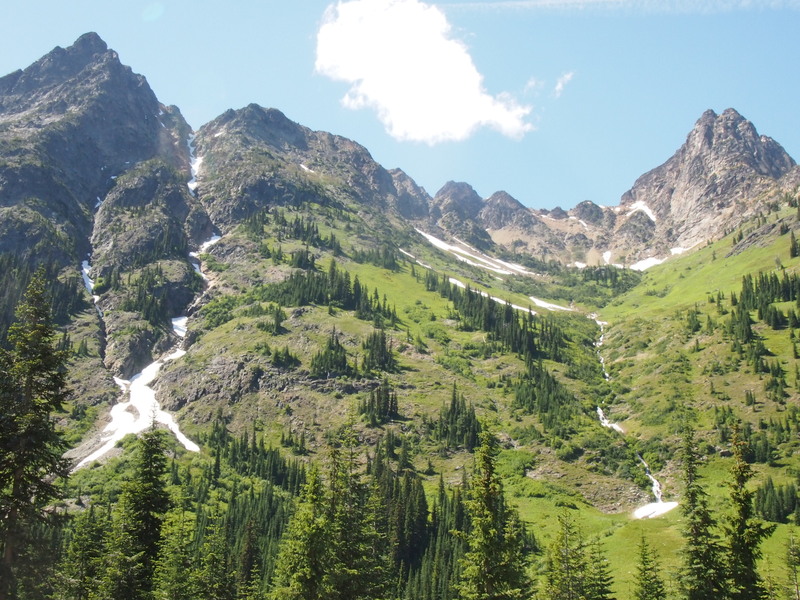 I am already planding a trip to see the North Cascade National Park. Thanks! It was beautiful; you won’t regret making the trip. 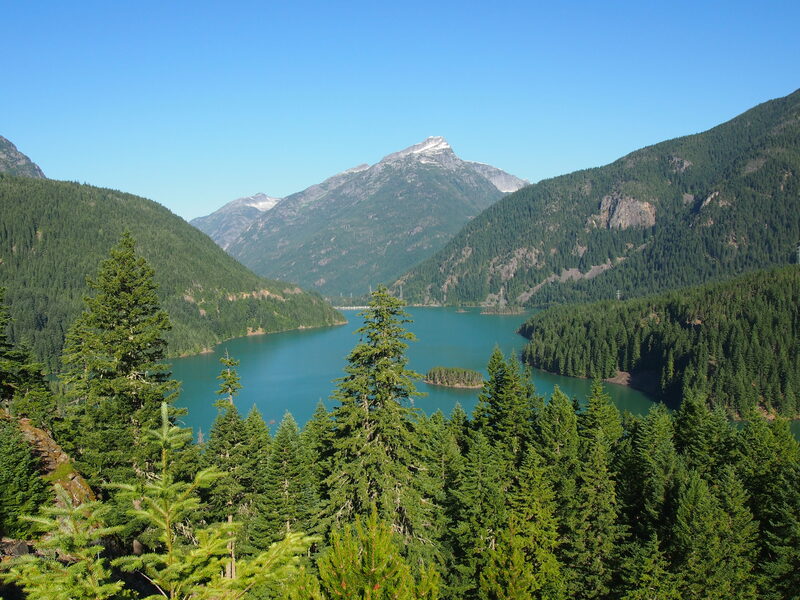 Our favorite parts were Diablo Lake overlook and Washington Pass overlook, although it seems like there’s much more to see if you have time to hike around.